British online supermarket Ocado has played down the impact of a fire which devastated its flagship distribution centre in England, saying the blaze did not affect its long-term plans. The comments helped to send its shares to a record high. 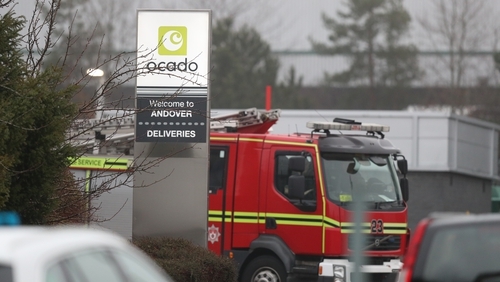 Though the cause of the fire in Andover is still being investigated, Ocado said its initial assessment had given it confidence there are no significant implications for the risk profile of its assets or the viability of its model. Last month when Ocado announced a £1.5 billion joint venture with Marks and Spencer. The company's chief executive Tim Steiner told reporters he knew the precise cause of the fire but could not share the details. "The fire has been a setback, but it will be only a temporary one," Steiner said. Ocado also said today that its retail revenue increased 11.2% to £404m in the 13 weeks to March 3, its fiscal first quarter, having risen 12% in the previous quarter. The impact of the fire was 1.2% of sales, it added. The company's chief financial officer Duncan Tatton-Brown told reporters he expected the impact in the second quarter would be about 3% of sales, reflecting a full three-months trading impact versus one in the first quarter. Before the blaze the Andover centre was providing about 10% of Ocado's UK capacity. The company had warned in February of a reduction in sales growth until it increases capacity elsewhere. Though Ocado has a 1% share of Britain's grocery market, its £8 billion stock market valuation has been driven by the technology side of its business. It provides international retailers with the infrastructure and software to develop their own online grocery businesses to compete with the likes of Amazon. The Andover plant, which was processing 30,000 orders a week, is Ocado's third automated warehouse and has been instrumental in it winning major deals to sell its technology to US group Kroger, France's Casino, Canada's Sobeys and Sweden's ICA. Late last month Ocado sold M&S a half share in its UK retail business for £750m.